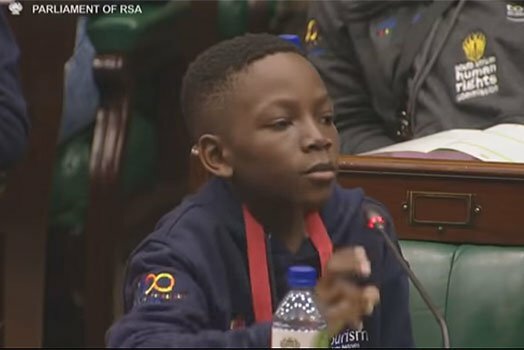 A South African boy has bravely asked the country’s parliamentarians to amend the law to have children who understand political issues vote. The boy’s address during the Nelson Mandela Children’s Fund Youth Summit has gone viral online. Many have lauded his bravery and understanding of the need to get involved in the country’s decision making process. At some point youths attending the summit chuckled as the boy said some children have a high intellectual capacity. “It’s not because of what is on the outside, it’s because of what is in the inside,” he concluded before proceeding to switch off the microphone. The chairperson of the session asked UDM MP Nqabayomzi Kwankwa -who was stunned- to answer the boy. “You see I think you are ready to vote for UDM next year, we’ll give you an ID,” the legislator said amid laughter. “On a serious note, this is a very pertinent question but I think there would be only a few exceptional cases where young people would be ready to vote at a very young age. I think that is also intended to protect young people until they are at the right age to be able to make those decisions,” he stated.